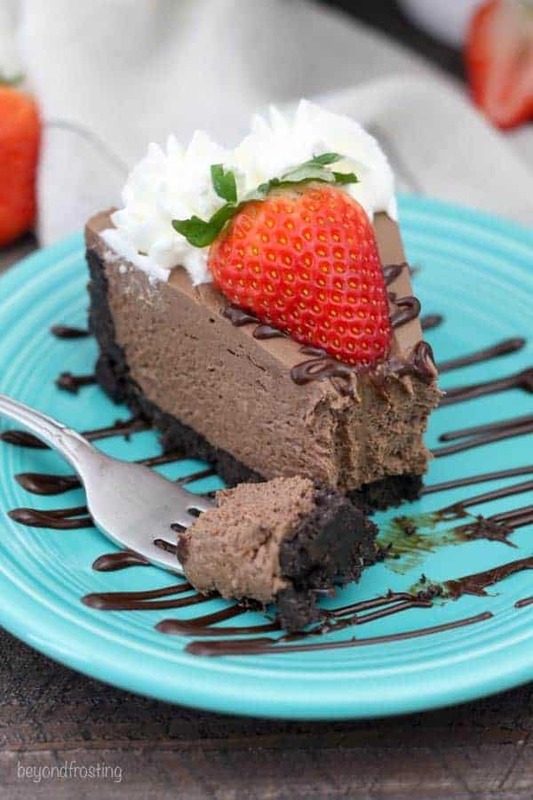 This is the Easy No-Bake Chocolate Cheesecake made without Cool Whip and no gelatin, this homemade chocolate no-bake cheesecake is so easy, just a few simple ingredients. This cheesecake isn’t too sweet and pairs perfectly with any fruit topping. This is one of those recipes that I credit entirely to my readers, because you guys are awesome! 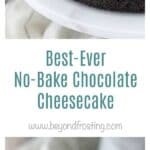 Earlier in the year, I shared by Best Ever No-Bake Cheesecake. Someone on Facebook asked me if I had a chocolate version, so naturally I had to make one! 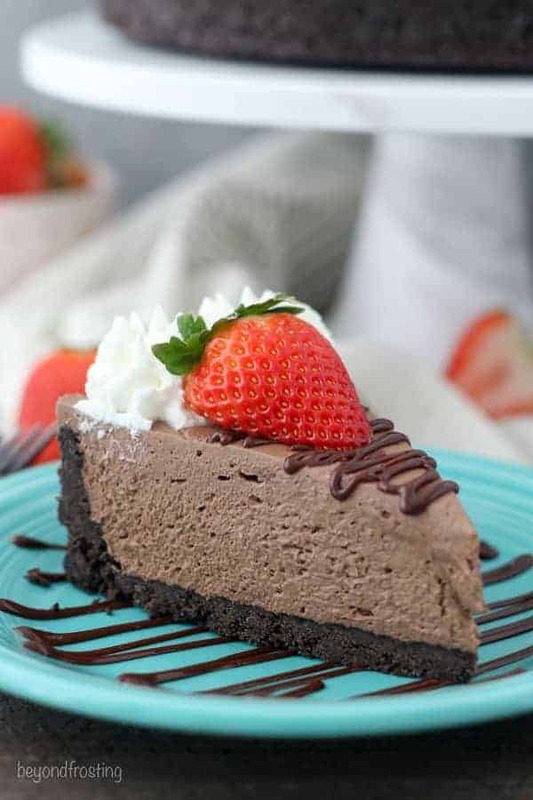 The primary difference between the vanilla and the chocolate no-bake cheesecake is of course the type of chocolate that is used, but also for this cheesecake you can use cocoa powder to intensify the chocolate flavor. There is plenty to be said about why I call this the Easy No-Bake Chocolate Cheesecake. The filling is silky, it’s airy but thick, similar to a regular baked cheesecake, but lighter in texture. It’s exactly what you want it to be. I’ve been adapting this recipe over and over through the past couple of years, but the basics of this recipe have always been the same. It’s similar to the recipe for my No-Bake German Chocolate Cheesecake. There’s plenty of cream cheese, mixed with homemade whipped cream, melted chocolate, vanilla extract and a touch of sugar. That’s right, there’s no Cool Whip in this recipe! Although if you really wanted to take a short cut, you could use Cool Whip instead of homemade whipped cream. The melted chocolate makes all the difference here. My preference for this is a dark chocolate, and it must be high quality chocolate. This is not a recipe I would recommend using chocolate chips for because the chocolate chips generally aren’t as good, and some of them can be oily. Some of the options are Ghirardelli Chocolate Bars or Callebaut Callets– which are seriously amazing. You need a little bit of granulated sugar to help sweeten the cream cheese and make it a little less tart. It’s best of your cream cheese is at room temperature because you can incorporate the ingredients much easier, especially when it comes to folding in the whipped cream. You’ll also notice there is no gelatin in the filling. You don’t need it because the chocolate helps to really stabilize the filling. For the crust, I opted for a standard Oreo cookie. Oreos make a nice and thick, buttery crust. Plus, the filling of the Oreos help adds some structure to the crust, so it holds together perfectly. Are any of you big crust fans? I know I am! I have plenty of tips for preparing a crust in a spring form pan if you need it. However, if you don’t have a spring form pan, you can use a 9-inch square pan as long as it’s at least 3 inches deep because this cheesecake a little bit tall. I suggest that you make the crust first and then prepare the filling. While you are preparing the filling, throw the crust in the freezer. This will help hold the crust together while you are spreading the filling. This is one of my no-bake desserts that you CAN prepare ahead of time and freeze! I prefer to refrigerate this cheesecake first and allow the filling to set. Then I throw it in the freezer. I place plastic wrap directly on the surface of the cheesecake and then wrap it in aluminum foil. When ready, thaw this in the refrigerator, preferable overnight. I always add my toppings prior to serving which would include any whipped cream, fruit or chocolate toppings. 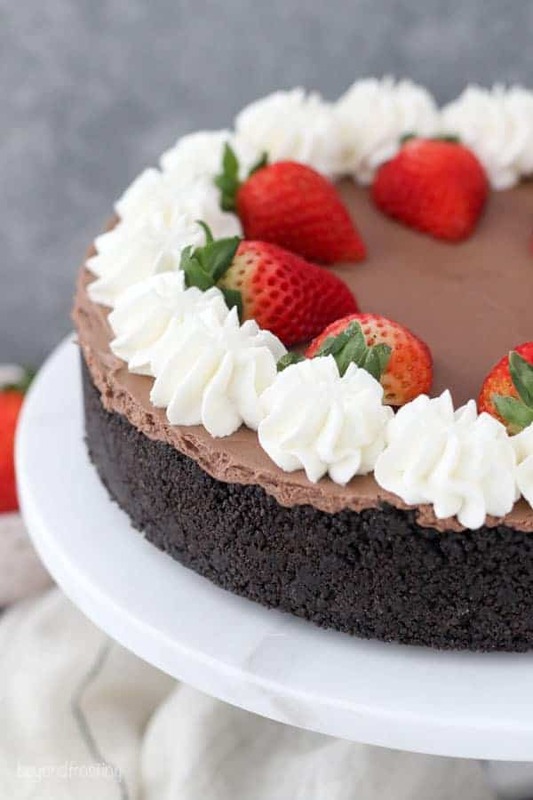 One thing is for certain, this Easy No-Bake Chocolate Cheesecake is simply irresistible with an intense chocolate cheesecake filling. For the filling: In a microwave-safe bowl, combine the dark chocolate and 4 tablespoons of heavy whipping cream. Microwave at 50% power in 30-second increments, stirring each time until the chocolate is melted. Stir until completely smooth. Prepare the whipped cream. Pour 1 ½ cups heavy whipping cream into the chilled bowl and use an electric mixer to beat the heavy cream on medium-high speed until the cream starts to thicken. Slowly add the powdered sugar and continue beating on high speed until stiff peaks form. Set the whipped cream aside. Finally, slowly fold in the whipped cream in two batches until it’s completely smooth. Pour the filling into the prepared crust, spreading evenly. Refrigerate for 3-4 hours minimum. Pipe the borders of the pie with whipped cream using a large open star tip. Garnish with fresh fruit. This cheesecake must stay refrigerated. This no-bake cheesecake can be prepared ahead of time and refrigerated for up to two days prior to serving. Otherwise freeze and defrost in the refrigerator the night before serving. The topping should be added before serving. Hi Delanie, I am sorry you had trouble with this. Over whipped cream probably shouldn’t be runny though, so it sounds like maybe that wasn’t right. And if the chocolate was hard, you would have definitely needed to remelt it before adding it to the cream cheese. Just wondering, if I can substitute the dark chocolate for white chocolate. Here is the chocolate cheesecake! 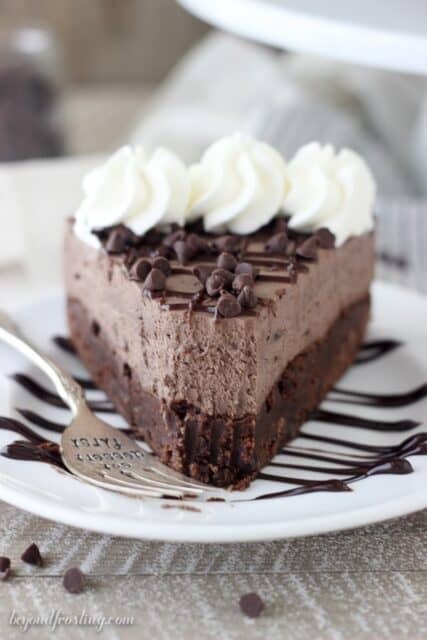 can I use white chocolate instead of the dark chocolate to make the mousse cheese cake? Hi can I use cocoa powder instead of melted chocolate as that is all I have on hand? Hi Ruby, I have no tested the recipe that way. So you might consider starting with 1/4 cup of cocoa powder and adding additional to taste. 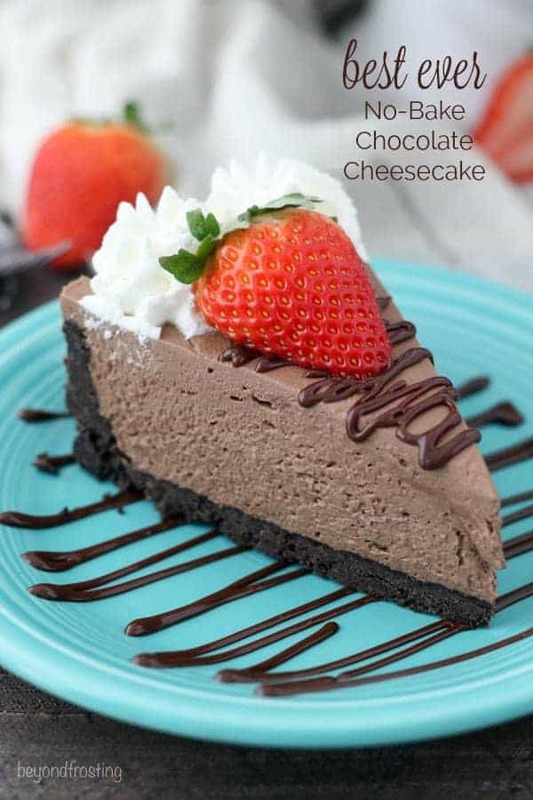 Hi, I’ve gone through several no bake chocolate cheesecake recipes and I really like yours and can’t wait to try it out! However, I’m quite confused with the measurement conversions. May I know how many grams is 1 cup of powdered sugar, granulated sugar and heavy whipping cream used in this recipe? I have a question. 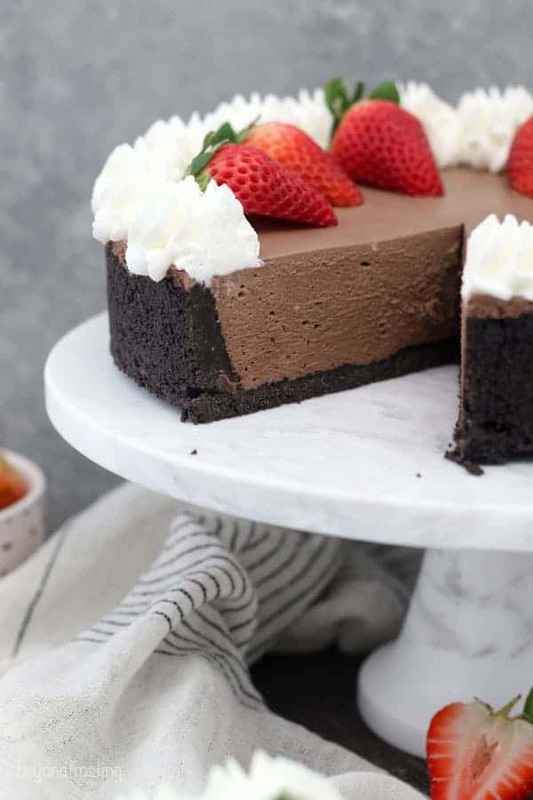 In the first comments about this chocolate cheesecake you said it has cocoa but, I read over and over and didn’t see how much or when to add it? 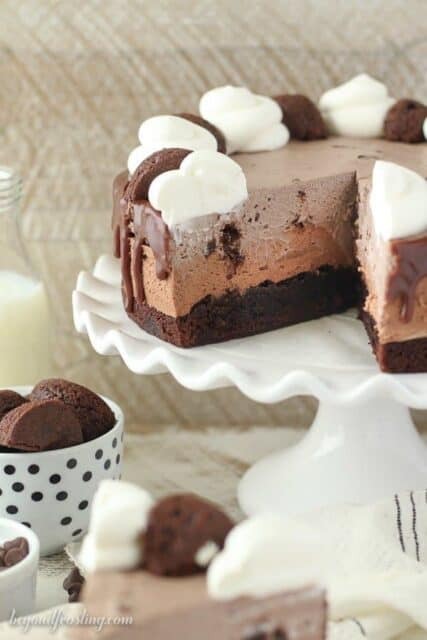 I wanted to make this today, I love all your cheesecakes and the no-bake ones are delicious. 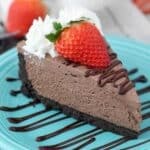 My family has been asking for a plain chocolate cheesecake for awhile now and I went looking for the best recipes. I found many with a lot added and I love those also such as german chocolate and many more but, they insisted I just make a plain chocolate then they can add whipped topping and such when its served. Thanks for posting so many wonderful cheesecakes. Hi Debbie, so sorry for the confusing. I meant that cocoa powder can be added to intensify the flavor. I honestly love it both ways. As is, the recipe the recipe is amazing. If you add 2 tablespoons of cocoa powder together with the granulated sugar and cream cheese, it intensifies the chocolate flavor. More like a “dark chocolate”. 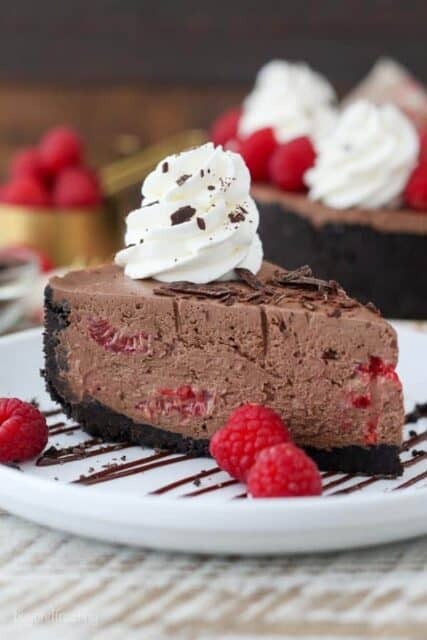 I did this for my No-Bake Chocolate Raspberry Cheesecake and it’s also amazing! Thank you for your quick response Julianne. I will try that also. Another question is if you use Cool Whip how much of that would you use? Sorry for so many questions but, I thought I had enough heavy cream but, didn’t but I did have cool whip in freezer and you said you could use that so wanted to go with what I had instead of making a trip to the store. Lazy day I suppose. Thank you again.